The June/August issue of Country Living magazine arrived in my mailbox and there was a snippet about making lavender linen spray. Since I had leftover dried lavender buds from making sachets, I thought I’d put my stock to good use. 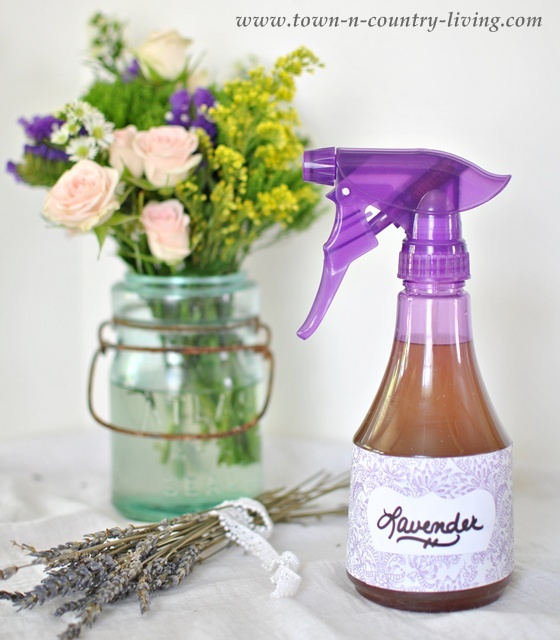 Lavender linen spray is very easy to make and is far cheaper than buying it in a store. Lavender oil is said to help induce sleep so I plan to use the lavender linen spray on our bed sheets. 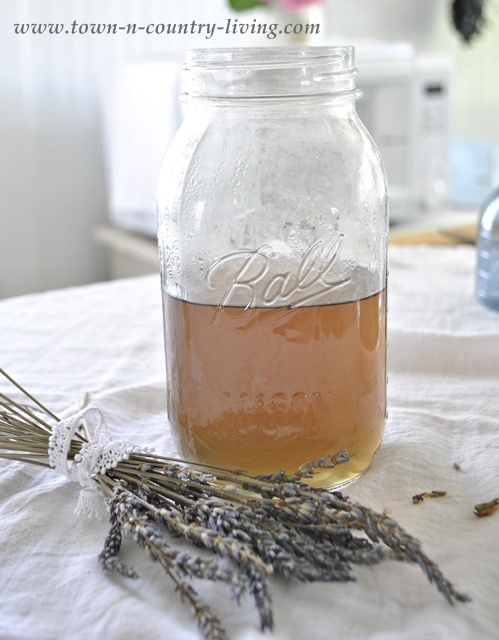 You don’t need a lot of supplies to make lavender linen spray. And no, the vodka isn’t for drinking. It’s part of the fragrant concoction. 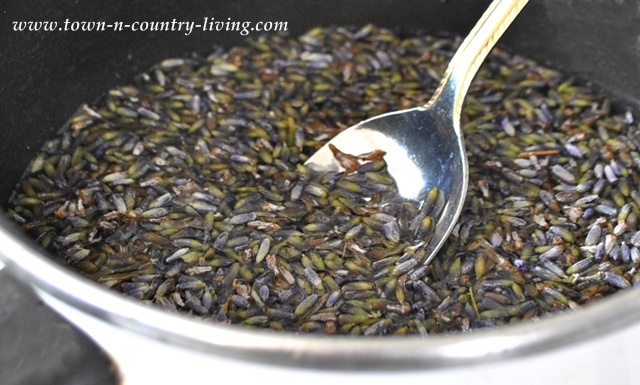 Bring a cup of water to a simmer, then add 4 tablespoons of dried lavender buds. Remove from heat and let steep for 5 minutes. You can purchase lavender flower buds online for $12 a pound. 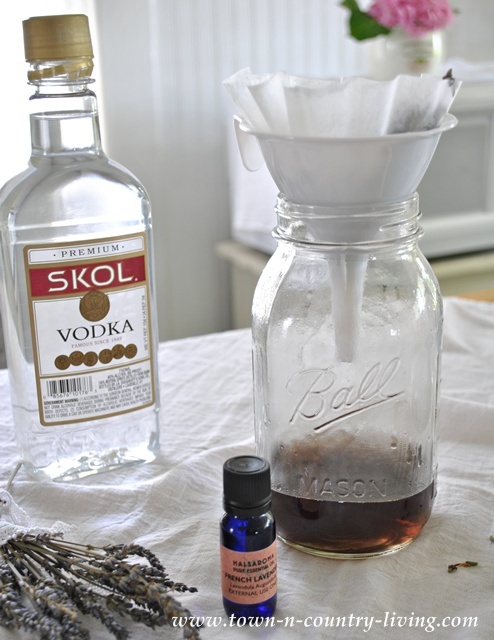 Place a coffee filter in a funnel and pour the lavender mixture through it into a large Mason jar. Once all the liquid drips through, remove the coffee filter and discard, along with the lavender buds. Bring 1 1/2 cups of water to boil in another pot. Remove from heat and add to the lavender mixture. Add 2 tablespoons of vodka and 12 drops of French lavender oil. Put lid on the mason jar and shake vigorously. 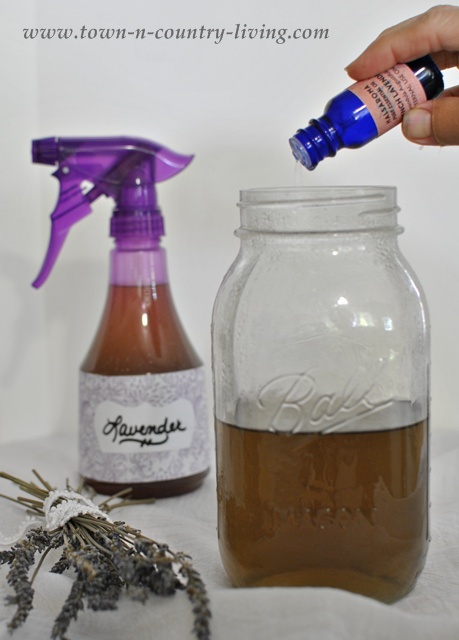 After the lavender mixture cools a bit, pour into a spray bottle using the funnel. 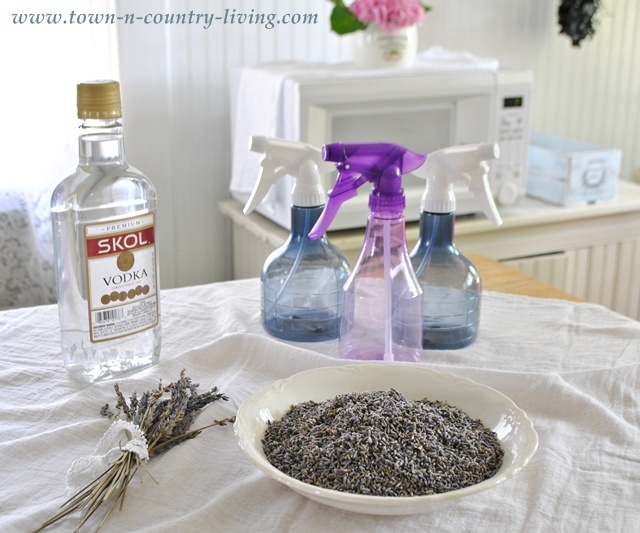 Spray lavender linen water on clothes when ironing, mist it on your pillowcase, clothing, or even furniture. French Lavender is one of my favorite scents and I’m anxious to use it! Would make a great gift, too. I use lavender linen spray and lavender lotion before bed and sleep wonderfully. You will love the spray. Since i wouldnt be using a big bottle of vodka for anything else can you think of any alternative? Thanks for your time sharing this…and advice. Buy a small “nip” of vodka, which all liquor stores sell. is there a substitute for the vodka. Yes!!! I make linen and body spray. I mix 3 parts DISTILLED water, 1 part Witch Hazel, essential oil of you choice. Put witch hazel in mason jar add EO put lid on and shake for about 20 seconds. Then add distilled water, put lid on and shake. I do not store in plastic, I use 4 oz Boston Round colored glass bottles with a sprayer. Witch hazel is good toner for your skin too. I use the spray on Body and pillow cases. I make lavender, lemon, sweet orange, and spearmint. This is great Jennifer. I love lavender spray for my sheets. I am going to have to try this out. Sounds great..could you make with the oil only? Idon’t even know where to get buds and I have the oil! I use lavender spray on my bed every day. I have to make my own now. Thank you. This sounds heaven, especially for sheet and towels. I have lavender blooming in my yard and should try this. Sounds great! I’m allergic to lavender. Can you tell me how I could make this with either mint or eucalyptus or lemon scents? Great idea to add the vodka! Thanks. What wonderful tutorial – cheers for sharing! What is the shelf life of this product? I’d be interested in trying it in my product line to sell but do not want mold or bacteria to grow. Is a preservative needed or does the alcohol do that? I know things with water usually always needs preservatives. Thanks! Keep in a dark place to age slower, and also, this spray is good to use on baby as bug repellent!! I use witch hazel instead of vodka. I haven’t tried it with the lavender buds, just the oil. I wonder if this recipe will stain your clothes. I use mine as an ironing spray as well. 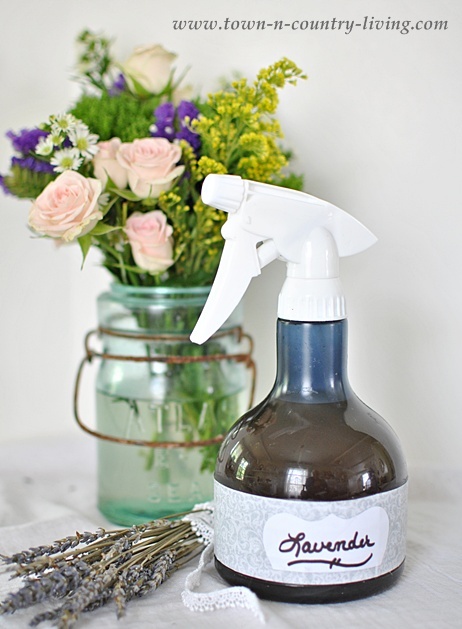 I want to try this spray, but I’m wondering about the spray staining the linens as well…does anyone know if it stains?…I don’t understand what the vodka does for this spray…does anyone know?…perhaps it does something to the lavender oil?…thx for any & all feedback…. The oils will mix with the vodka (they don’t mix well with just water, you have to shake it a lot.) Plus, the alcohol is a preservative so gives it a great shelf life! alcohol is used to make a ‘tincture’ , it is a non polar solvent. In other words you can make alcohol a solvent for things that don’t dissolve in water! Oil will dissolve very well in alcohol. I think it helps it dry faster. Like rubbing alcohol does without the smell rubbing alcohol has. Just wondering – if you don’t use all of the Lavender Water in one go how long does the fragrance last for? Does it go off? Veronica, I typically have my linen spray for several months and the fragrance doesn’t fade. The vodka helps to preserve and intensify the scent. I had Lavender spray bought commercially and it is no longer in the store so this I will try since the new Febreze does not help with my sleeplessness. I have acute insomnia and lavender seems to help a bit when I put it on my pillow. I am just trying to find the most effective product out there with staying power. Sleepy Tag. Can you use this spray on a childs bed at night? Under 1 years of age? For Tag and Karen – lavender is indeed helpful in falling asleep as is Chamomile. I used those essential oils – a couple of drops each on a cotton ball tucked into the corner of the pillow case for my grandson who had trouble falling asleep. It worked wonders. I’m never without my bottle of lavender – good for cuts, bug bites, headaches, and so much more. It is the ONLY essential oil that can be used straight from the bottle and only in small doses – all other EOs have to be diluted. I tried this recipe and its JUST like the expensive linen sprays at the fancy lavendar stores! Thanks, I will always make my own now! From the color of the liquid, it looks like it might leave spots on sheets, etc. Does it? I’ve never seen any spots from using the spray. Definitely have to give this a try.. thank you!